For a moment there, orange was my color of choice. I think I was coming off a sepia phase, but don't rightly recall. 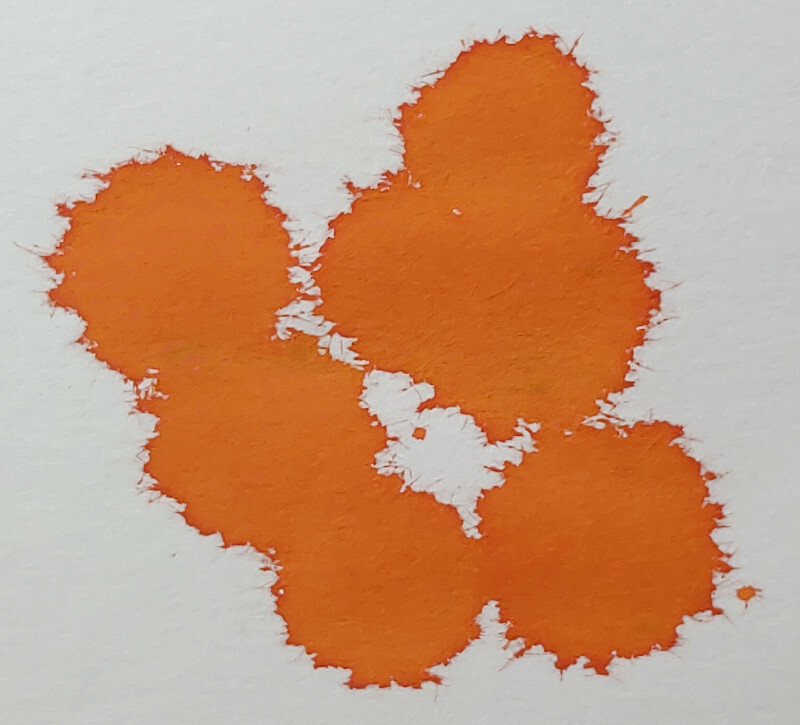 I got myself some Diamine Autumn Oak and took a flyer on J. Herbin Orange Indian. 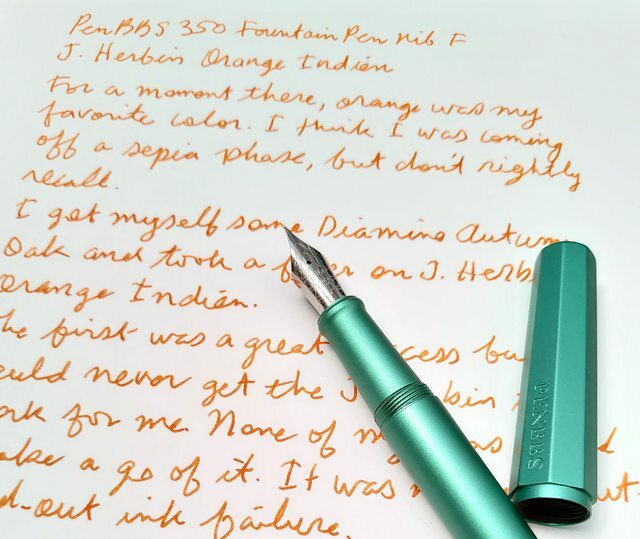 Conceptually, the PenBBS 350 combo hits it out of the park. I love the idea of including a rollerball in the mix. It fits the style of the pen and it writes very well. The line is satisfyingly bold and the rollerball is smooth, agile and consistent. The texture of the pen is light but real: a matte finish with just little grip. Nice. The cap comes off in under 1 1/4 turns making this a fast pen to cap and uncap. There's no clip but that's not a bother for me. I don't need one. The nib is the same PenBBS F No. 6 that comes with their other pens. It's a great nib and performed up to expectations out of the box. 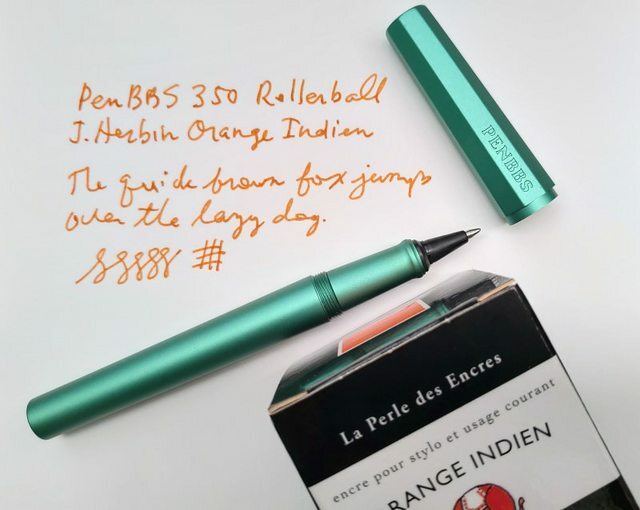 Given the aluminum construction and minimalist, industrial design, I put the PenBBS 350 in the workhorse camp. It's durable and functional and could easily serve as a beater pen for everyday use. It works as a full-sized pocket pen. At under US$15 on Taobao, it's a heck of a value. More pictures and comments here. I was also impressed about the idea of fitting a rollerball pen and a fountain pen in the same body. And I like the peculiar mint-turquoise color of this model. I can see why, the blue and red is appealing and I feel it is "that" shade of red and blue that most people love. Edited by penzel_washinkton, 07 September 2018 - 15:27. Does this pen swap in a #6 Jowo? I tried a PenBBS 308, but it crunched the nib when I capped the pen. Haven't tried, but it sure looks like there's enough room in the cap. The plastic cap liner doesn't look like it would pose any problems. Did a review on the "new" red 350 with two tone nib, to watch skip to 7:55. Have a green & black "older" model. Differences I found were minor. It is a great pen, I enjoy writing with it. But then I like metal pens. What Does The Penbbs "marshmallow" Acrylic Look Like In Real Life?